With metal titans Dragged Into Sunlight ridding atop perhaps their greatest album yet, Getintothis’ Zach Jones sits down to talk about what looks like a noise-riddled future for metal. With releases from The Body and Thou, Merzbow and Full of Hell, Crowhurst turning from a solo harsh electronics act into a four piece black metal band, and Manchester’s very own Caina switching at will from black metal howls to synth driven distortion, the collaboration between Dragged Into Sunlight and Gnaw Their Tongues, that has yielded the recently released N.V., is yet another jewel in the disgusting crown of noise/metal collaborations. It seems like the realms of heavy music and noise are coming ever closer together. But how can noise, a sound that arguably found its feet through artists such as Bauhaus feeding the exploratory minds of industrial artists, find musical common ground with artists influenced more by Leviathan than Lou Reed? Well perhaps it’s this linear thinking these collaborations are trying to destroy. From CS Lewis to William Blake, there is a common theme within the philosophy of poetry, that the poet should be ‘unconscious’ while writing. That we don’t consciously create, but are in fact, almost possessed to create, regardless of our surroundings. Now here’s the rub, regardless of whether we have synthesizers or guitars, we will present our surroundings, our thoughts and feelings. That is what makes art, art. The medium we use to do so is irrelevant. A 17th Century musician would express their pain through a violin, a 21st Century musician will express it by screaming into a vocoder. Getintothis: So if we lived in a ‘perfect world’, do you think Dragged into Sunlight would be a different band? It’s a sentiment that echoes throughout their harsh near apocalyptic sound and it explains perfectly why noise music exists. It shines a light onto the darkness that is in the recesses of our society. The extremities in the music echo that. Both genres, noise and metal, are constantly pushing the limits of music, arguably doing so to greater effect than any other style of music today. Dragged into Sunlight: “Suffice to say, it is a mutual pull determined by common interest. “Somewhere between the two genres there lies a degree of overlap and commonality. Noise is recognised as extreme music and the crossover is clear. In fact following our tour of Japan in 2014, there was discussion with Merzbow as to the blurred lines between noise and extreme music. “There appears a theme amongst less established noise artists to place rhythms and familiarities which is a world away from the likes of Vomir for example yet there is continuous debate as to what is noise and what is extreme music. Whereas in contemporary extreme music, the movement is towards pushing the next boundary and it is unclear where the breaking point between artists such as Gnaw Their Tongues and Merzbow is on the basis that both artists pursue such intense levels of extremity. “The reality is that contemporary noise artists do share significant overlap with the other genres of extreme music, and the word other is utilised in the loosest sense as extreme music is noise and vice versa to some extent. “The collaboration with Gnaw Their Tongues came about from a chance meeting in 2011, at OCCII in Amsterdam. 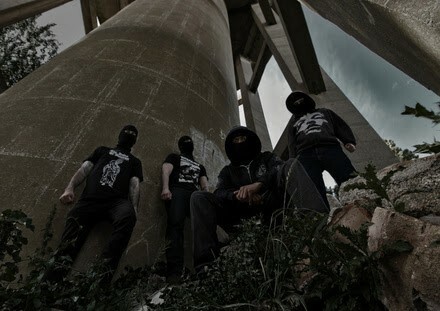 Dragged Into Sunlight has always had a strong noise influence with tracks such as Terminal Aggressor in 2008 and Totem of Skulls in 2009, it is the feeling that one can create using such soundscapes that is of interest. “Our decision to work with Gnaw Their Tongues was natural as if it were meant to be, and similarly it was Gnaw Their Tongues who replaced Dragged Into Sunlight following the postponement of our performance at Maryland Deathfest 2014, ironically so that we were able to focus on concluding the recording between us. Getintothis: So how did the process work as a writing and recording project? Was it written together or were there MP3 demos being emailed left right and centre? Dragged Into Sunlight: “Ideas were often transferred electronically, at one point there was in excess of 3 hours of recorded material. Sometimes, there would be nothing for months, perhaps during the release of Widowmaker or our US tour with Cough in 2012, followed by times when demos and ideas were being exchanged daily. Getintothis: So moving on from the album itself, and on to more general Dragged into Sunlight things. There is a fair amount of obscurity surrounding the band with undisclosed identities, a relatively hard website to navigate and very little in the amount of accessible information, yet I’m still able to buy your two studio albums in HMV. Do you think there is merit behind that level of high distribution while maintaining a level of anonymity? Getintothis: Does any of the obscurity surrounding the band feed into the music, or does the music feed the obscurity? Essentially how important are all the aspects non-musical to Dragged into Sunlight? Getintothis: And just to end, if you could pick some fairly recent highlight releases that people may not of heard of, what would they be? Dragged Into Sunlight: “God Mother and Pissgrave had two of the stronger releases in recent years. 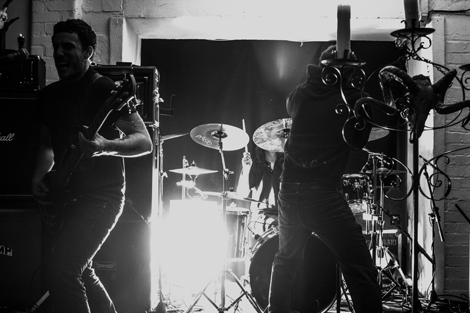 Employed To Serve have a new record on Holy Roar and DVNE have recently recorded new material with Tom Dring. NV may be one of the finest records to come out this year and yet, for most people, it will slip unknown and under their radar. Within that lies its importance. Dragged Into Sunlight will continue to scream away in the darkness, simply because they can.